Today I found out why some plants are considered weeds and others are not. Weeds can be defined in a variety of ways: a plant growing where it isn’t wanted, a plant that interferes with farming or grazing, a plant that was not intentionally sown, a plant that is persistent and detrimental to the plants around it, among others. Basically, what it comes down to is that weeds are plants that humans don’t want to have around for one reason or another. In the United States, there is a federal weed list and many states have their own weed lists, too. Some common flowers appear on the state weed lists yet appear in gardens and flower bouquets across the country. For instance, baby’s breath (Gypsophila paniculata) is considered a noxious weed in California, while the ox-eye daisy (Chrysanthemum leucanthemum), your typical white daisy with the golden centre, is considered a weed in numerous states, including Colorado, Kansas, Ohio, and West Virginia. Some weeds are simply plants that are not wanted in the place where they are growing, but are useful at other times. For instance, a wild raspberry plant smothering a crop of strawberries planted by a farmer. In other areas, a weed might be an invasive species of plant which threatens a country’s natural flora. An example of this is broom, or Cytisus scoparius, which grows abundantly in Scotland and is used in ornamental landscaping, sand dune stabilization, and wasteland reclamation. It was even used as a symbol of the Plantagenet kings. However, in Australia, New Zealand, and parts of North America, it is considered a pest species and often eradicated. Sometimes weeds were considered undesirable in the Old World before they came to the new one. Weed seeds were unintentionally spread after they were mixed in with seeds of other plants, like those of vegetables. Other times, farmers found weeds useful to help other plants grow—such as sweet briar in New Zealand, which was used to help grafted roses grow, and then became a pest when it spread. 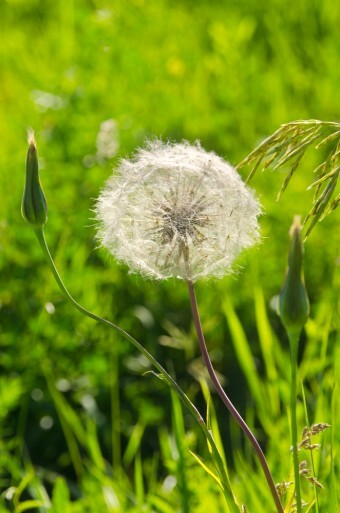 Typically, weeds also possess certain characteristics that make them particularly irritating to the human race: they grow and spread very quickly, which can hurt the surrounding plants by depriving them of sunshine and nutrients in the soil. Their spread can be attributed to their abundant seed production and the hardiness of those seeds, which can lay dormant in the soil for long periods of time. Weeds themselves are also hardy, often able to live in extreme conditions and in places affected by human interference. To sum it up, weeds are typically extremely difficult to exterminate from a garden bed entirely. Other than acting as an invasive species in new areas, weeds also are often considered such as they are plants that pose a threat to farmers and their crops. Weeds can contaminate crops, reducing crop quality; they can host diseases which kill the crop; shelter insects in the winter which will then eat the crop; and they could also produce toxins, infecting the crop with chemicals that are dangerous for human consumption. Needless to say, farmers tend to want to keep weeds away from their crops. They spend billions of dollars every year on herbicides to keep weeds at bay, but even that doesn’t stop all of them. Additional money is lost on crops that fail or are contaminated because of weeds. Their loss in profit means higher prices at the grocery store for the consumer. Weeds are usually grouped into two categories: broad-leaf weeds, which as the name suggests have broad weeds and usually a coarse root system, and grassy weeds, which grow to look like grasses and have a finer root system. They can be further defined by their life cycle, just like regular plants. Annuals complete their life cycle within a year and won’t regrow; biennials take two years to germinate, grow, and die; and perennials will last for at least two years, but many will continue to reproduce for much longer than that. Out of the estimated 250,000 plant species worldwide, only about 3% of them are considered weeds. Some weeds are edible, including dandelion and clover. Of course, we don’t recommend that you hunting in their backyard for some of these tasty treats, as many plants have poisonous look-a-likes and sometimes not all parts of a plant are edible. The entire dandelion plant actually is edible. The flowers can be used to make wine, the leaves will provide you with your recommended daily intake of vitamin K, and the root can be used for brewing a drink that tastes a bit like coffee. It’s also commonly used in soft drinks. Some plants that are widely considered to be weeds are actually medicinal, such as St. John’s Wort (Hypericum perforatum). This is sometimes used as an herbal treatment for depression. I have a friend who like to take dandelion blossoms before they bloom, dip them in pancake batter, then deep-fry them. Says they’re a little bitter, but tasty. Words of wisdom by Peter Griffin (Family Guy). know, I always think, who the hell decided tulips were so great?